The New Hampshire endgame polling presents an interesting contrast. The Republican race shows virtually no hint of an "Iowa Bounce." The Democratic race, on the other hand, is showing a huge bounce for Obama and a drop for Clinton. Edwards is largely unaffected. The charts also show the better performance of the sensitive red-line estimator when things are as dynamic as they have been since Thursday. 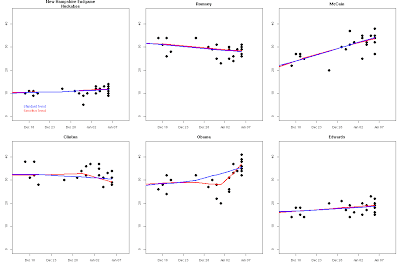 The Red estimator catches the upturn in Obama support pretty well, while the blue estimator is trying hard to keep up but its "slow to change" nature means it totally misses the timing of the upswing. If anyone were actually asking if there has been an Obama bounce, surely they are no longer asking. The Republican side is a bit more sedate, probably because the leader there, John McCain, was hardly a top finisher in Iowa. The upward trend for McCain, and the downward one for Romney, predated the Iowa caucuses. At most the trends we saw earlier have largely continued. Huckabee appears to be the candidate without a bounce, in fact. These are dynamics we've seen before when Iowa has had an impact. The short interval between Iowa has been much debated. One side says it doesn't allow enough time for an Iowa bounce to be fully felt. I'm of the opposite opinion. The short interval maximizes the effect of Iowa by not allowing time for losers in Iowa to retool their approach and for "added scrutiny" of the Iowa winner to slow their climb. The issue for Clinton and Romney is how to halt what is beginning to look like disastrous slides. With more time between events they would be better able to recover. If New Hampshire is a second loss for both, then both campaigns have to find ways to recover by South Carolina. An Emerging Republican Consensus? Can it be?